Crammed into the middle of the back seat, I sat at the drive-in theater with my older sister and her friends on the newspaper staff. She and her best friend Donna, who were seniors, sat in the front seat, and I sat over the hump in the middle of the back floorboard between Mark and Danny, who were freshmen, a year older than I was. They chattered and passed me the popcorn but didn’t invite me to join the conversation. It was enough for me, though, that my sister had grudgingly taken me along to see the 1968 version of Shakespeare’s Romeo and Juliet, which had premiered the year before but had just made it to the rural areas of southern West Virginia. I fell in love with Shakespeare and became infatuated with Mark that evening. One of them would never take an interest in me. The other wooed me with a love that transcended space and time. You can probably guess how that turned out. These two films, along with a plethora of trashy romance novels and even a few literary classics like Jane Eyre, shaped the way I thought marriage was supposed to work. Marriage wasn’t the messy, complicated relationship my parents modeled for me—it was a romanticized view of the world—even inLove Story, despite the fact that the plot is complex enough that the rich boy’s father disowns him for marrying the poor girl. My sister said I was the girl who wanted a neat little house with a white picket fence. She was right, but I suspect I wasn’t the only girl of my generation who saw love through the characters in the books and films that dominated the bestsellers in those days. And though I got the little house, it had no white picket fence to keep the love inside, and my first marriage fell apart after a few years. So when I could love again, I chose someone who brings out the best in me and, I hope, I in him. But I can’t pretend it was all about choice, either. My minister once commented that love was 95% love and 5% luck. 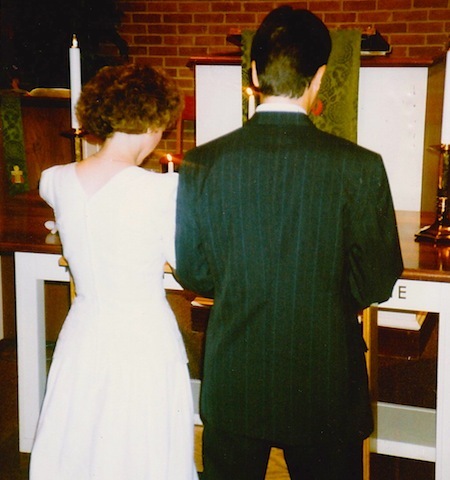 I chose my husband, but I’m not sure I could have done otherwise, given the raw voltage that arced between us in those early days of our relationship. But the therapist helped me learn that the patterns we set in the beginning of a relationship are either the patterns that plague us or the patterns that sustain us when life gets in the way of the overwhelming passion and emotion of early love. So what have I learned from two very different relationships? That love definitely means having to say you’re sorry. And not that kind of qualified sorry—“I’m sorry, but you made me crazy when you [fill in the blank here].” Yes, the person you love may have exacerbated whatever conflict you’re having. But an unqualified apology opens the door for that person to say, “I’m sorry, too,” instead of just leading to the same fight over again. I’m thankful that there haven’t been too many times that call for unqualified apologies. My husband is far more generous and giving and easy-going than I am, and I lucked into finding someone who reminds me to laugh every single day. But I also remember what my therapist said about patterns, so from the very beginning I’ve tried to remind myself and tell my husband every day what it is that I love about him. We take care of each other’s hearts most of the time, and that has sustained our marriage for nearly 22 years now. I wonder sometimes how our children’s views of love are being shaped by today’s movies and bestsellers. And while it’s taken me a while to learn that romance is only a part of a good relationship, I feel a little sorry for young people whose views are being shaped by the narrative emphasis on solely physical fantasies. But though I’m an English teacher, I also have to admit that while great contemporary literature is more apt to show the complexities of love, few great literary works end happily. And in real life, while there are no fairy tale endings, many couples do find love and joy together. Previous PostYour Way? My Way? A Third Way?Next PostChange the Team Name?